Somebody buy this for me for Christmas please. Every Christmas, Holt Renfrew imports gourmet goodies for gift-giving (past seasons featured England’s Fortnum & Mason and France’s Fauchon…this year it’s Selfridges). I went window shopping on Sunday to look at all the things I can’t afford and saw they now have their own line of luxury teas! $18 each. 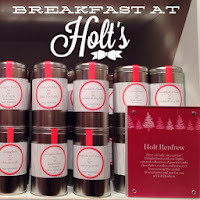 I tried to research these teas online and didn’t find much except some of these flavours are offered at holt’s cafe (which is also home to the yummiest chicken pot pie!...minus the mushrooms).